I remember having photos like this taken by Gav at a similar stage in my pregnancy with Rory, on our bed in the old London flat. Back then it was just me and my belly, and and nothing more than some ideas about who the baby inside would be. Just over three years later and that’s this baby, my Rory, no longer a baby but my beautiful, sweet, funny girl, snuggled up next to my 35 week old belly with another as yet unknown baby girl inside. I’m anxious to meet her now, to see her face, to hold her in my arms and to know she’s made her way out safely. Rory talks about her all the time, and laments frequently about how long her baby sister is taking to come out. Her and me both. A large part of this pregnancy went really quickly, but since my nights got so long with this dreadful insomnia I’ve been feeling like I might be pregnant forever. This stage has been a drag, a big uncomfortable, sleepless drag, and I’m so ready to get this baby out. Gav had a week off work last week, and although we initially thought we’d use it for a few days away somewhere, we decided our time would be best spent doing some much needed DIY instead. We’ve had a busy week working on the house, painting the hallway, clearing out and organising the lean-to next to our kitchen (previously a death trap of tools, paint cans and broken things) and generally giving everything a good clean. The baby’s room is coming along, I’ve been slowly taking things out of storage and getting them ready for her arrival, reminding ourselves of everthing we need to take a care of another newborn. Borrowing what we can, buying the odd thing here or there, and packing the hospital bags and a box for the home birth we’re hoping for. I’ve been trying not to over exert myself, while still maintaining a relatively high level of activity because it’s both helpful and necessary. The baby was breach at my 32 week appointment, which is completely normal and nothing to worry about, but it did get me thinking about needing to stay active and do anything I can to encourage baby to get into the right position for birth. I’ve been crouching and lunging, hanging forward off the sofa and scrubbing carpets on all fours, all in the names of creating space in my pelvis so this baby knows where her head needs to go. It’s nothing if not weird, being this pregnant. In the last few days the baby has dropped, my bump has changed shape and I’ve a little more space to breathe and digest my food. Not to jinx it, but last night I had my first night of sleep (aside from waking at 1am to see to Rory and 4am to go for a wee) in five weeks. The first night in five long weeks where I haven’t watched the clock until 3.30 or 4am before finally passing out for a few hours until woken up by Rory deciding that morning has arrived. I feel a little more emotional than usual, welling up at the slightest thing, so perhaps there’s some hormonal changes at this stage that might bring my sleep back to me for a short while. The Braxton Hicks contractions have started too, and some days I get them every few minutes where my whole uterus tightens and it feels like I’ve swallowed a basketball. It’s a reminder that my body knows what it’s doing, that it’s preparing for birth and that all I have to do is trust it to do its thing. I listen to my hypno-birthing audio files every night in bed, the affirmations, guided meditations and breathing practice are keeping me calm and focused. I feel excited about the birth this time around, more informed and educated, more supported and more confident in being able to advocate for my choices. I’m hopeful of having the peaceful, empowering home birth that I’d like so much, while also doing my best to be open minded to whatever scenario presents itself. My doulas came for my first prenatal visit last week, and things started to feel very real. Just three more weeks until they go on call for me, and then baby can come any day after that. I’m almost at that weird limbo stage of pregnancy where waiting is really all that’s left to do. Almost, but not quite. This week is my last week of work, then the week after that I’m busy settling Rory into a new nursery as sadly her childminder we love so much is winding down her business to make way for her own family commitments. Once all that’s done, the waiting will begin. I remember it a little from when i was pregnant with Rory, but as my waters broke at 39 weeks I didn’t have much waiting to do. A week perhaps, but that’s all. I reckon this baby isn’t going to leave me waiting too long either, I just have a feeling about it. Just come earthside around your due date little one, that’ll do nicely for me. Rory’s still in my bed every night, with Gav sleeping in another room, but since I’ve not been getting much sleep her 1am cries for me haven’t been a disturbance. In fact, I look forward to them now, feeling a little lonely in my bed without her face pressed against mine and her arms around my neck. 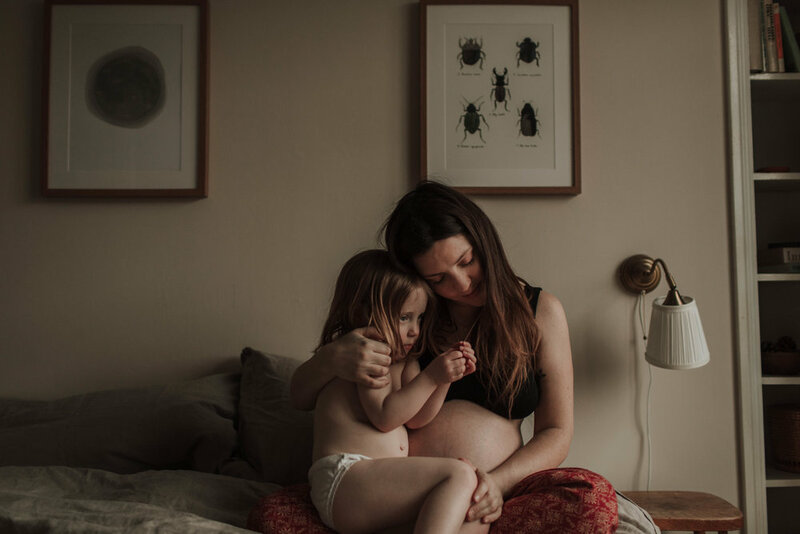 It’s been so lovely having that closeness with her, and now that I’m nearing my due date I don’t think there is a better way to get the oxytocin flowing than cuddling her in my bed each night. It’s so sweet to wake up to her singing, or asking me about dragons (Mama, where do dragons live? Mama, can we have a dragon? Mama, I think there’s a dragon in the house, can we go see?) or gently kissing me awake. She sure won’t do this forever, so I’m banking all the goodness while it lasts. We’re so close, her and I, and it’s my favourite thing just to be in her company, even in the middle of the night. Mostly we sleep, but sometimes she sneaks downstairs with me for a midnight snack, or we play shadow puppets on the ceiling using the light from my phone, eat cereal out of the box in bed, or make up stories about wolves and fairies and monsters. We’re rolling with everything being so very out of sorts, because I can’t see any reason not to.